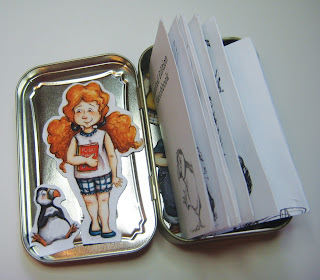 I'm super excited to be able to make this public news. I got an agent!!!! I'm now officially represented by Joanna Volpe at New Leaf Literary & Media. 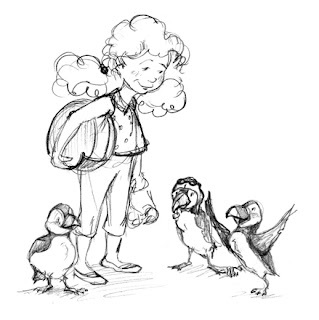 Check out New Leaf's website: http://newleafliterary.com/index.cfm. 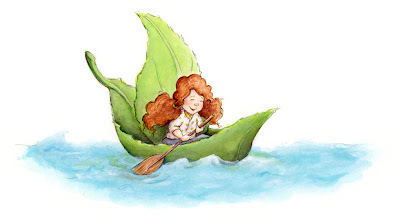 The agency represents a whole bunch of really talented writers and illustrators (including fellow mentee, the fabulous, Maple Lam), and I'm so honored to be counted among them. 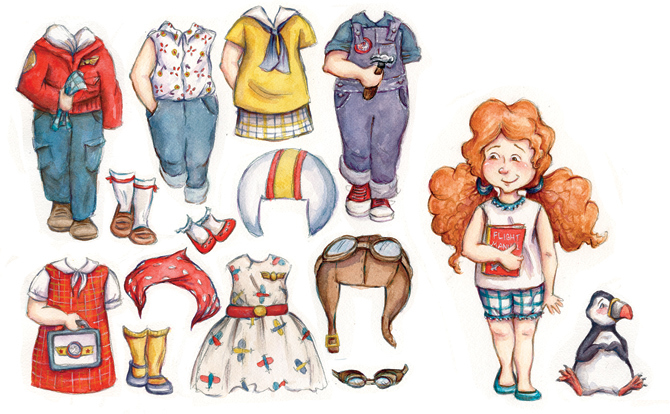 I was invited to do a process post over at the KidLit Artists blog and thought I'd also share it here and show you more of the painted progression. 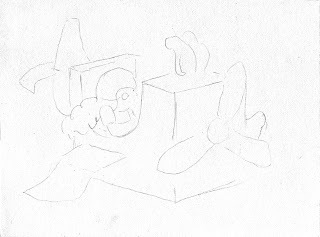 I think best with a pencil in hand, and my process begins with doodling. 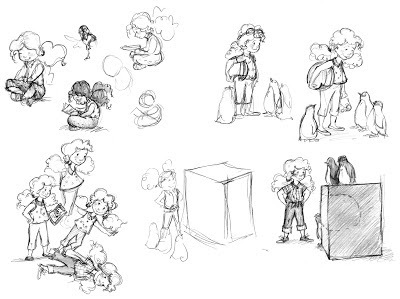 I actually get to know my characters through the sketching itself. Eventually I get hooked on an idea or image, and I draw it over and over again. In this series, what started as a single character became three, penguins eventually turned into puffins, and a narrative began to emerge. Once I've found an image that I like, I do an extremely loose transfer on a light box. 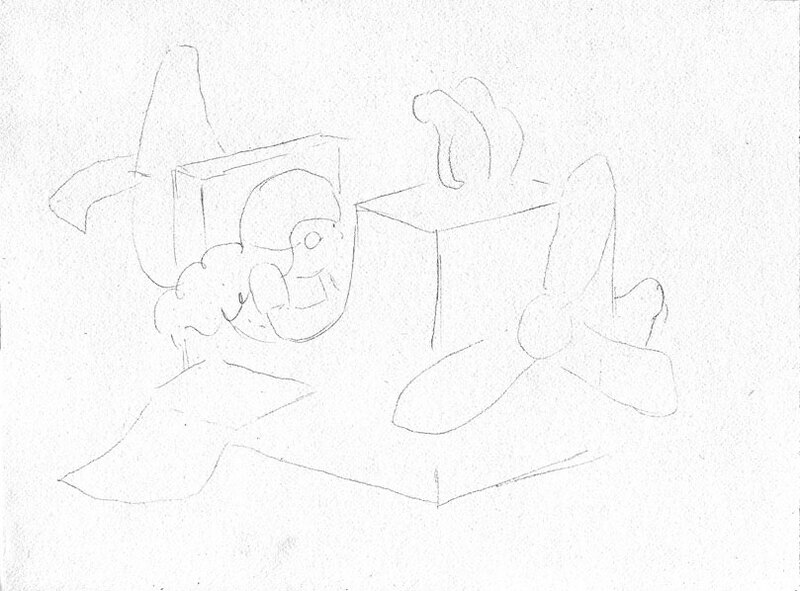 And by loose, I do mean only a handful of lines. 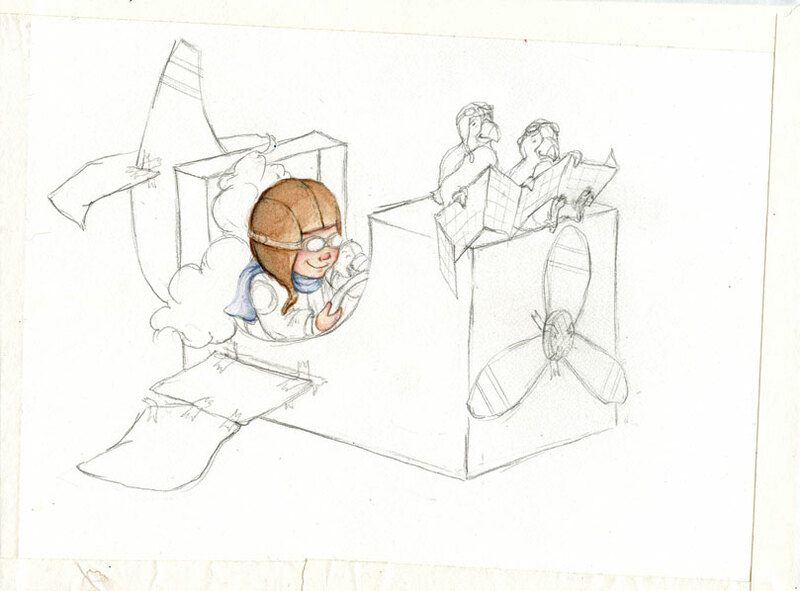 I then redraw the sketch entirely, fleshing it out and adding details. 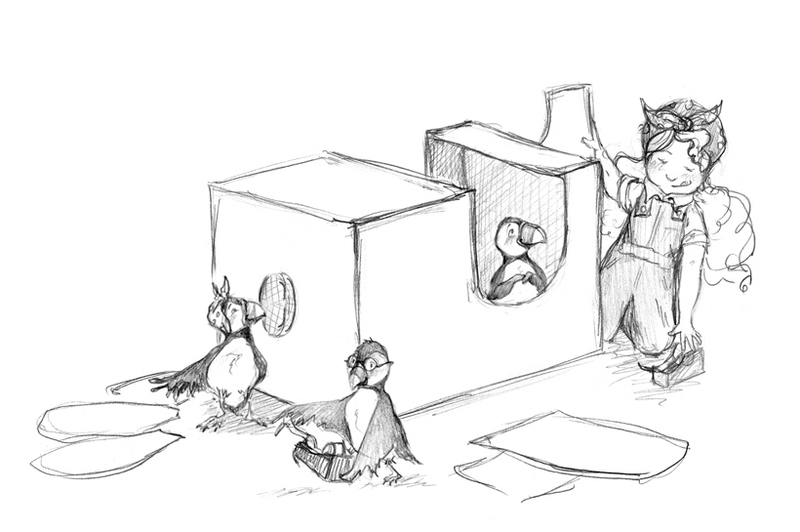 Next, I do a quick value study and an even quicker color study, filling the large areas in photoshop. 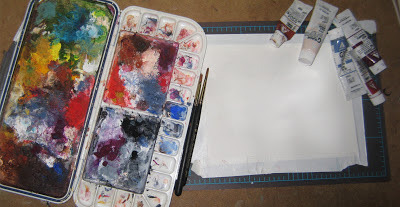 I've recently added this step to my process and have found it extremely helpful; it ultimately makes the painting much easier. At this point, if it's a piece that requires large washes, I stretch my paper and staple it to a waterproof board. 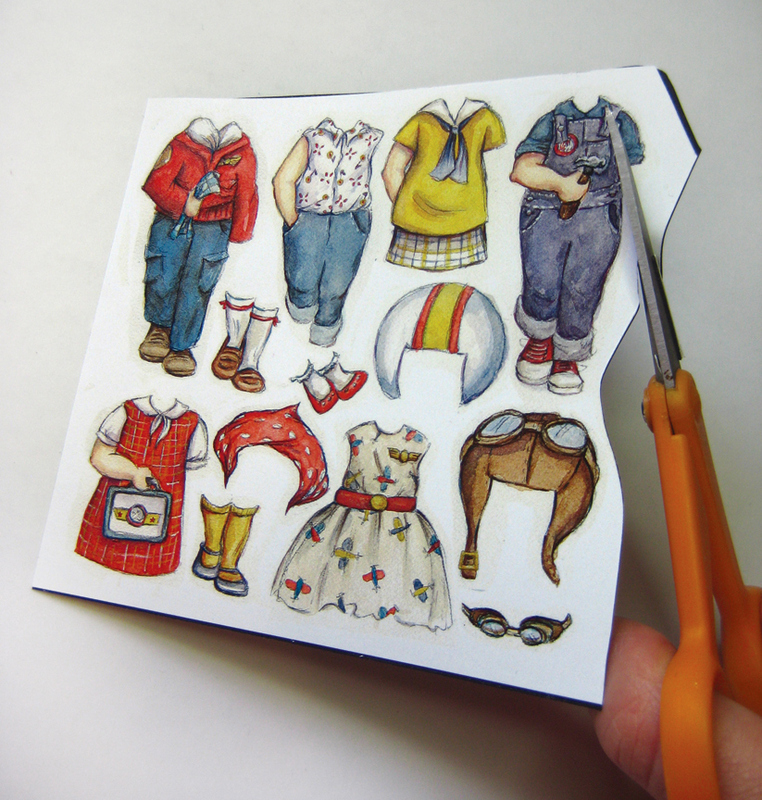 For a small spot illustration like this one, I just tape it to a small cutting mat. I use Holbein Acryla Gouache and these lovely little brushes from Princeton Artist Brush Co. 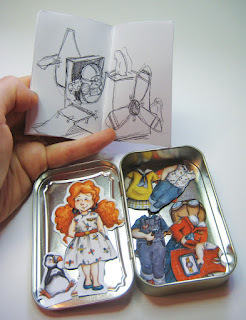 I have an amazingly fun project to share with you. 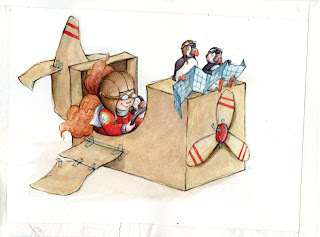 Last fall when I went out to California for Lost Weekend with the other KidLit Artists, our mentor David Diaz, gave us a wee homework assignment. 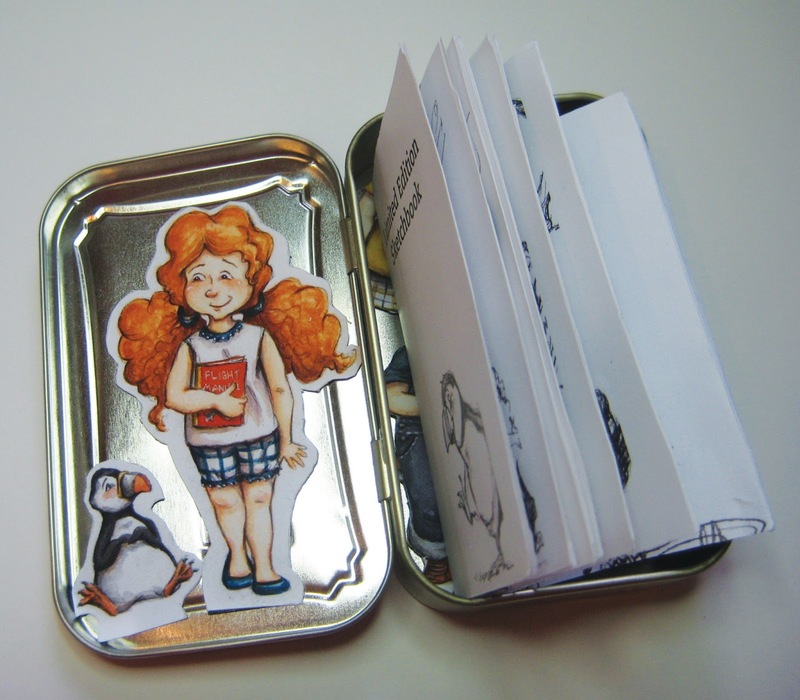 Create a limited run promotional piece--beyond a simple postcard--for $5 or less. The piece should showcase your work in a unique way and get art directors and editors interested. 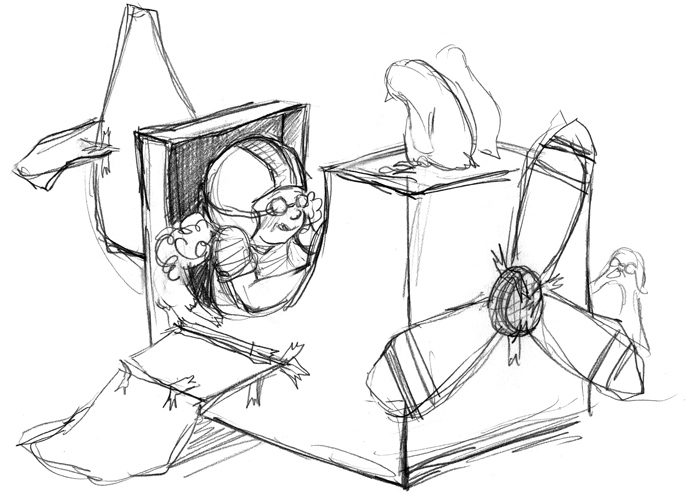 I thought for a while. 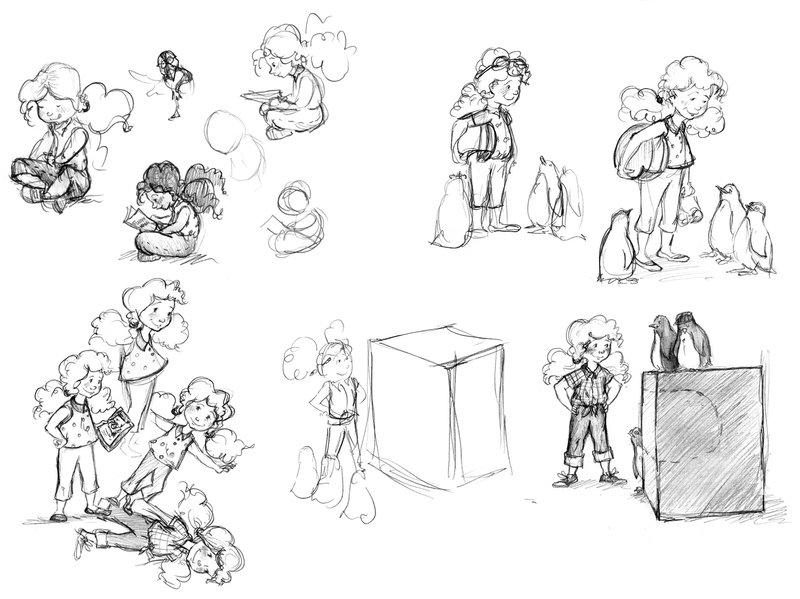 I wanted to make something fun, but I was worried that my ideas didn't really showcase my portfolio. 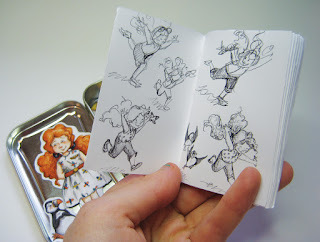 Finally, I gave up trying to showcase my entire body of work and decided to create something that would highlight a few of the things that I'm good at-- like lively characters, lots of fun details, and even a short narrative--and would later entice folks to check out more of my work on my website. 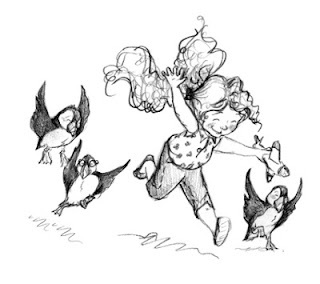 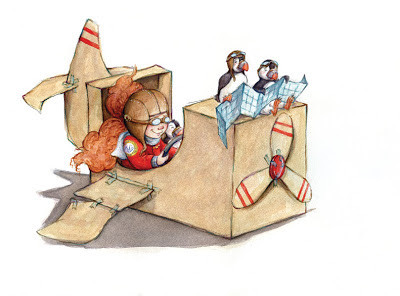 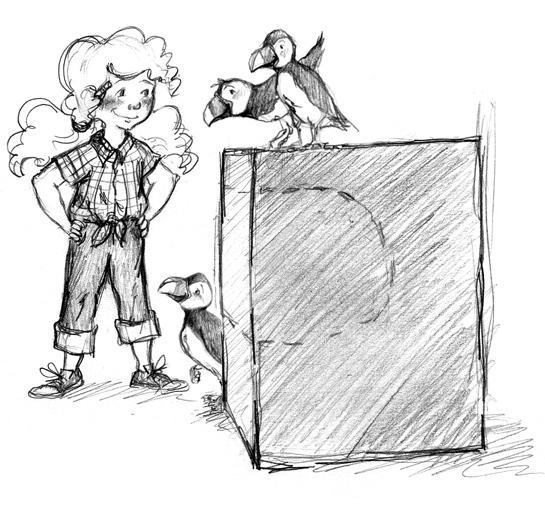 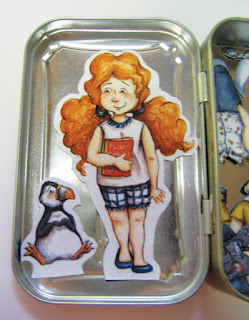 The penguins became puffins, and I began to figure out who this little girl was. 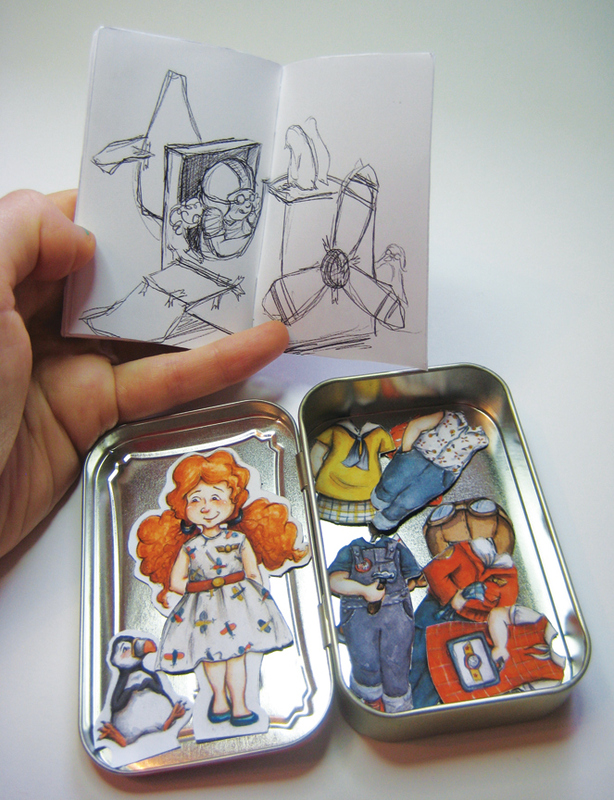 When it came time to settle on a format for the promo, I finally decided on a "paper-doll" magnet with a limited edition mini-sketchbook. 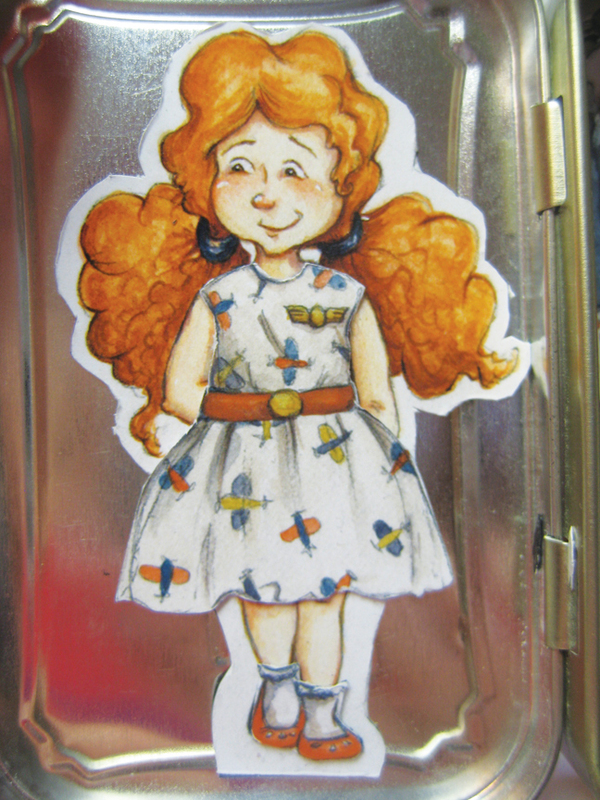 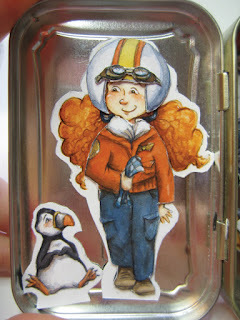 I started by creating a wardrobe for my little pilot--let's call her Rosie. 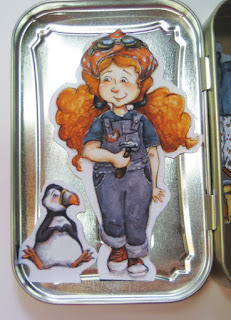 I printed Rosie, her little puffin buddy, and her wardrobe out on paper, pasted it onto adhesive magnetic sheets, and then cut them out with a scissor and an x-acto knife. 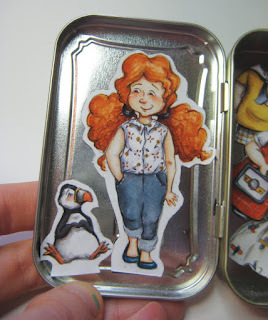 I'm also a sucker for tiny, miniature things, and I wanted Rosie to come in a neat little package. 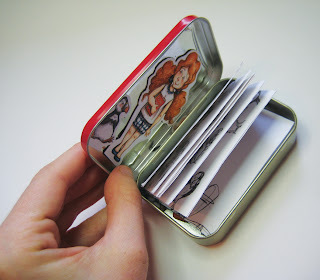 The prototype for the promo is actually an old Altoid tin that I painted, but I found a supplier online that sells tiny white metal tins for less than a dollar a piece. 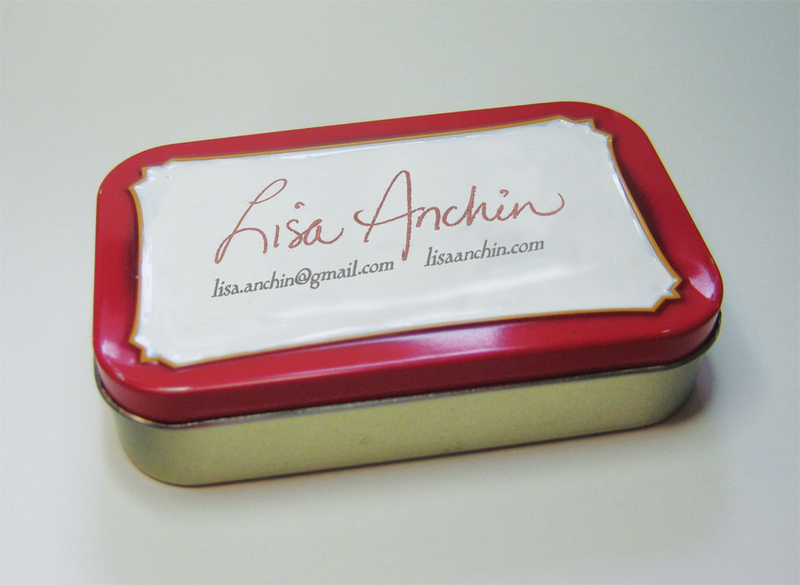 Later I'll paint and decorate the boxes with enamel. 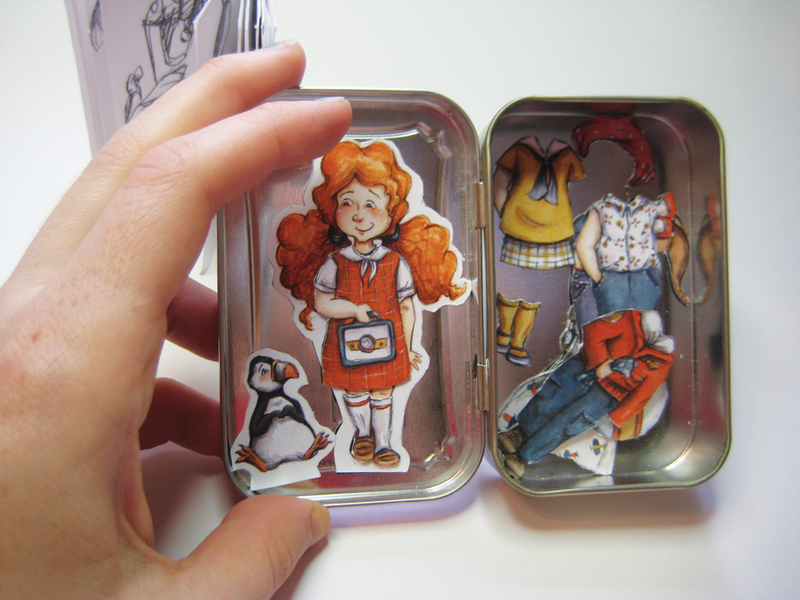 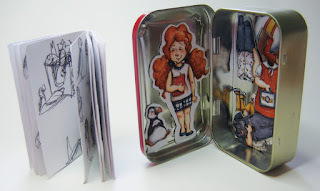 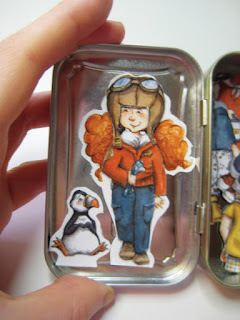 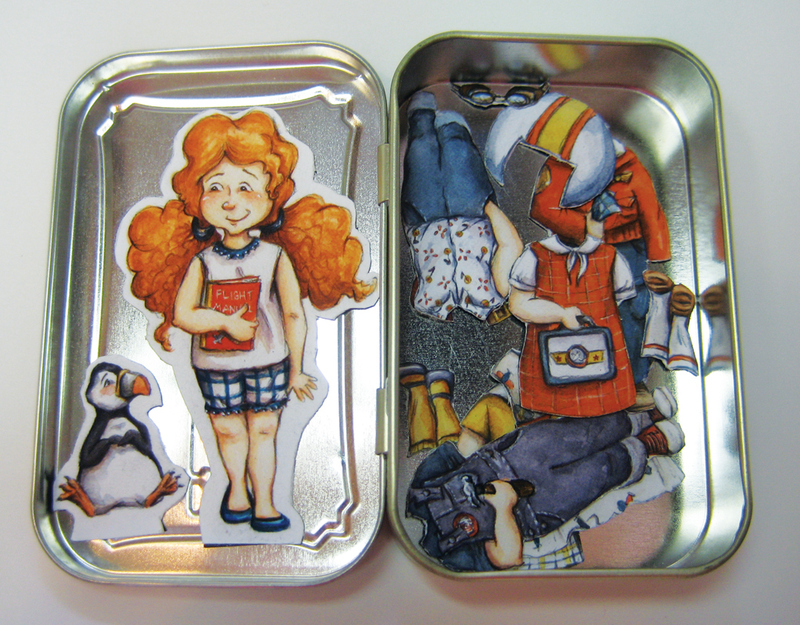 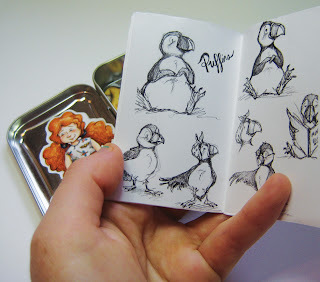 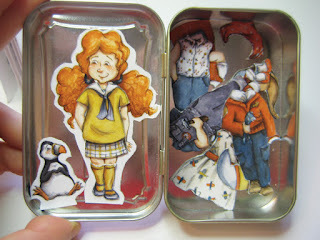 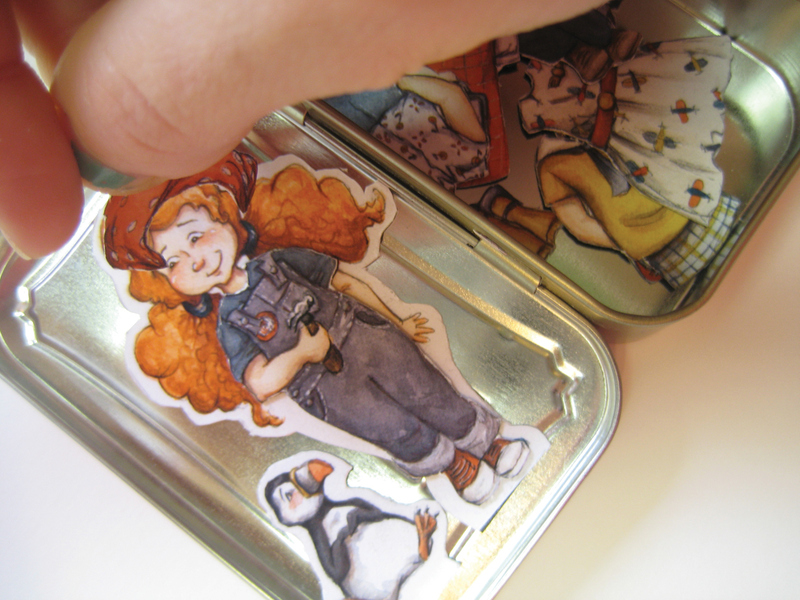 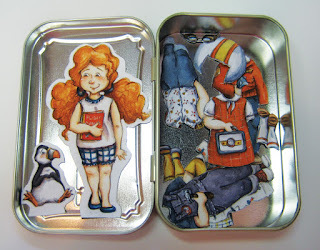 When you open the tin, the little girl and her puffin friend sit neatly on the left side, and on the right is the Limited Edition Sketchbook. After removing the sketchbook, you see all of her little magnetic clothing. 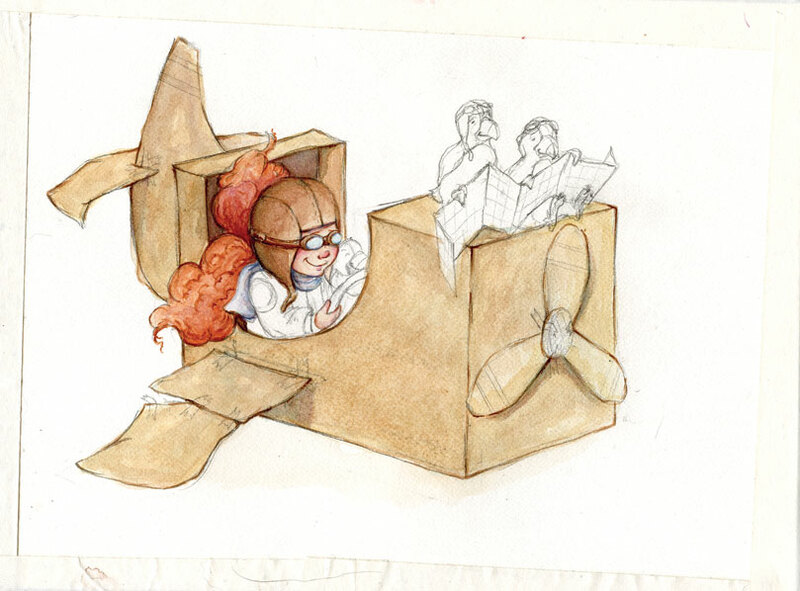 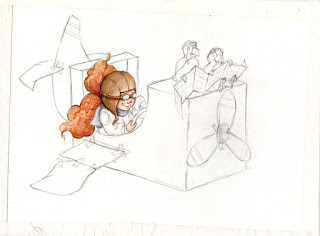 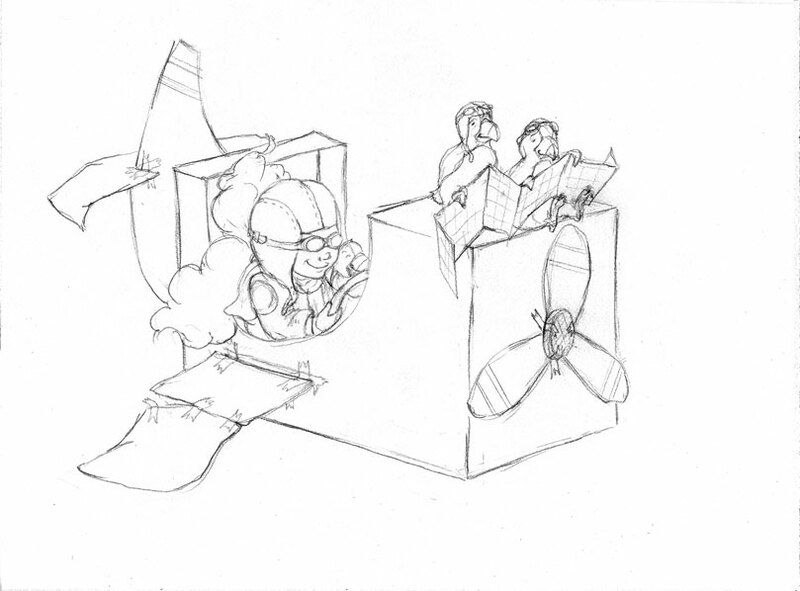 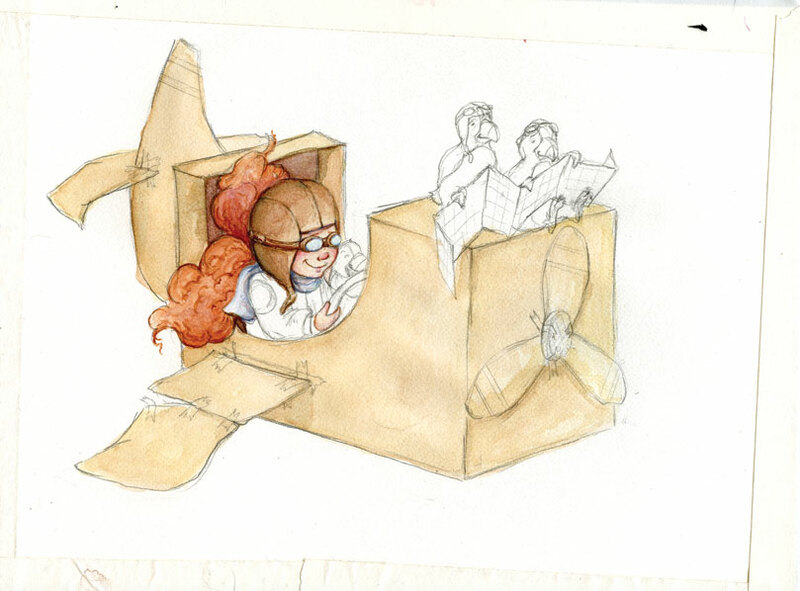 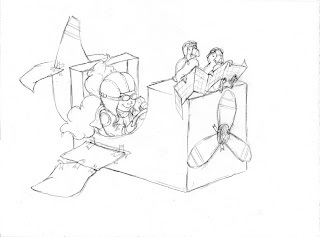 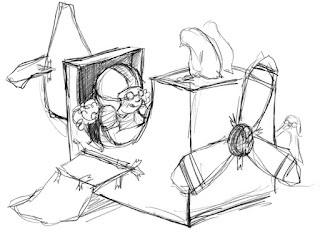 The Limited Edition Sketchbook has all of the prep sketches that I did for the website and Rosie's cardboard box airplane. Ta da! Such a fun project. 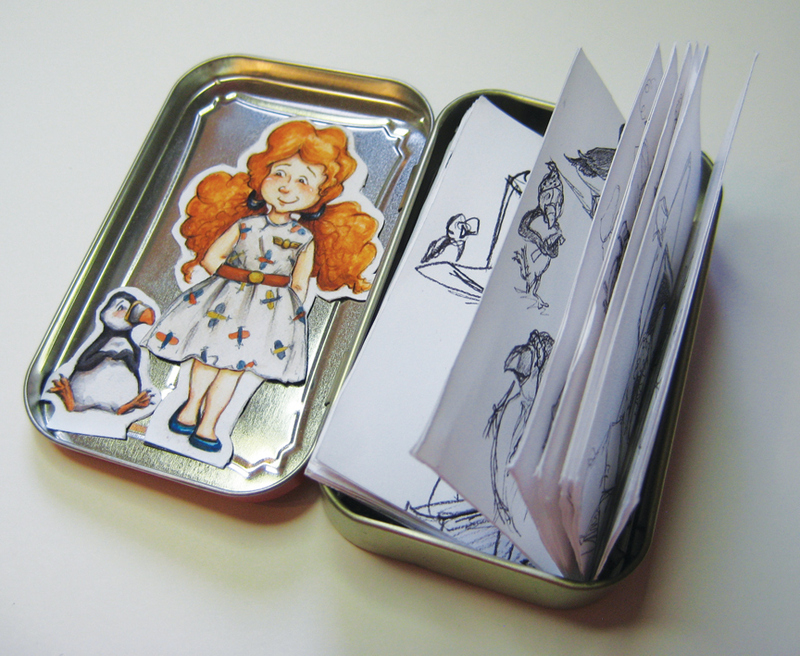 I'll be printing a small, limited edition run of 100 to be sent out when I relaunch my website, this Spring.